After Angels pitcher Shohei Ohtani started the season on a tear, hitting .367 with three homers through eight games, and posting two dominant starts that featured a five-inning stretch with 65 pitches and 10 strikeouts, it seemed his only kryptonite would be an eventual regression to numbers resembling normalcy. Enter the blister. 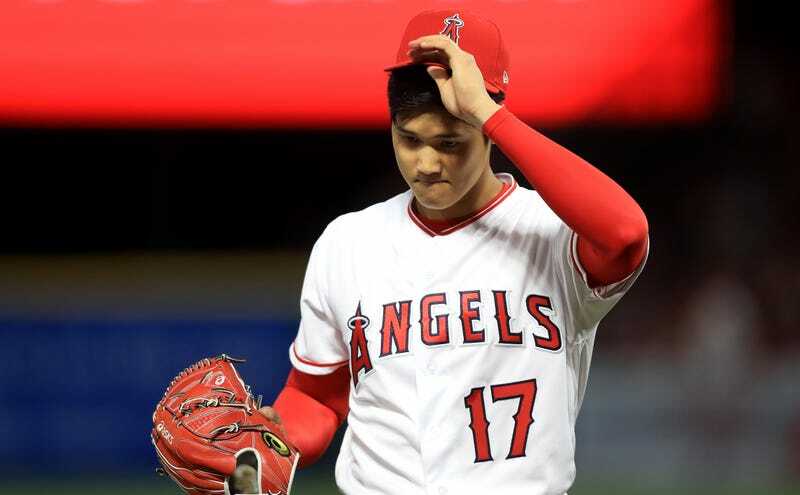 Ohtani was pulled last night after just two miserable innings against the Red Sox with a blister on his right middle finger. After the game, Ohtani said the blister affected his grip on basically all of his pitches, including his best pitch, the splitter. Worryingly, this is not the first time Ohtani has had to deal with a blister on his pitching hand. In 2016, when he was still playing in the Japanese professional league, he was kept off the mound for several weeks because of a blister. Hopefully he doesn’t need as much time to allow this one to heal, but blisters can have notoriously unpredictable effects on pitchers. Please don’t let this be a Rich Hill situation; it would be particularly cruel for one of the most exciting young players in the history of baseball to be diminished just as we’ve gotten introduced to him. Is The Uptick In Blisters Another Sign Of A Juiced Ball?